I write this on the fourth day of World Sherry Day. Yes, you read that right, a day that has so far lasted four days, and there are a few more to come. World Sherry Day is, in fact, seven days long. You may well think that there is a perfectly good unit of temporal measurement that covers just such a time frame. But no, World Sherry Week simply would not do. Forget the Summer Solstice – this is the longest day of the year. Winey days are all the rage at the moment – Syrah Day and Carignan Day were in February, Malbec World Day was in April and International Sauvignon Blanc Day just last week. Looking ahead World Cabernet Day happens every year in late August or early September, just a week or so before International Grenache Day – but sherry is trumping the lot. Its bloated extension has lead to an unfortunate clash: today, Thursday 23 May, will not only see World Sherry Day stretch beyond its 96th hour but also witness the cork pop on International Chardonnay Day. Rather disappointingly, particularly for fans of Portuguese fortified wine, World Port Day turns out to be an annual maritime event held in Rotterdam. There is some logic behind most of the scheduling, with white wines celebrated just as the first rays of spring sunshine warm the backs of northern-hemisphere drinkers and red wines toasted as the leaves are pondering their autumnal colour change, or bang in the middle of winter. Forget wine-and-food matching, this is wine-and-season matching, and there is no wine for which it is more important than dry sherry. If dry wine in general is an acquired taste – just try giving some to a child if you’re not sure (it would probably be wise to ask their parent first) – dry sherry is a taste to acquire after that taste is acquired. I have witnessed seasoned wine-lovers literally shriek with horror at the first sip of a fresh Fino, whose unique flavour comes from the time it spends in a barrel covered – and let’s not beat about the bush here – by a thick layer of fungal growth. If you want to introduce someone, possibly yourself, to the joys of dry sherry you need to pick your moment. It makes no sense out of context. Supping it while there’s frost at the window would just be jarring, like welcoming dinner party guests by putting the Banana Splits Theme on the stereo, or decorating your child’s nursery with a full-scale replica of Picasso’s Guernica. But sitting outside on a warm afternoon, with a plate or two of something salty – cured ham works well, olives will do, salted marcona almonds are the absolute best – and condensation beading on the fridge-fresh bottle, it’s very fine indeed. If you’re in Spain it’s better still, but you may find almonds easier to arrange. One of the cool things about dry sherry is the price. Really expensive ones simply don’t exist – they’re either cheap, or very cheap. If the queen decides to have a glass, it will come from a bottle that cost less than £15 (though if I were a trader I’d perhaps be tempted to bump prices up a bit if I saw a customer walk in wearing ermine and the Koh-i-Noor diamond). Hidalgo’s reliably good manzanilla La Gitana costs around £8 for a full bottle, but if we’re talking royalty, the crown prince of dry sherries, Tio Pepe’s “En Rama” Fino, released each year since 2009 at the start of spring with a warning to have it drunk by the end of July, costs £13.95 at The Wine Society and is equally available from Adnams, Berry Bros, Lea & Sandeman and others. You can buy it by the half-bottle for an even cheaper fix. Dry sherry is not for everyone, but sweeter styles are very hard to resist. Having sipped your fino/manzanilla on the patio/roof terrace/postage-stamp-sized London garden with some pre-dinner nibbles, consider coming inside when it gets a bit chilly, sorting yourself out with some tangy cheese, or just some glasses, and opening a bottle of Matusalem, a sweet oloroso sherry from Gonzalez Byass (the people also behind Tio Pepe) that has been aged 30 years (and still costs a thoroughly non-ludicrous £15-£20 for a half-bottle, from Ocado, Tesco online and independents) and is seriously nutty, figgy, luscious and, at 20.5% abv, dangerously moreish. It can be hard to say no to another one, which is quite possibly also what the organisers of World Sherry Day thought when they came to schedule their celebration. 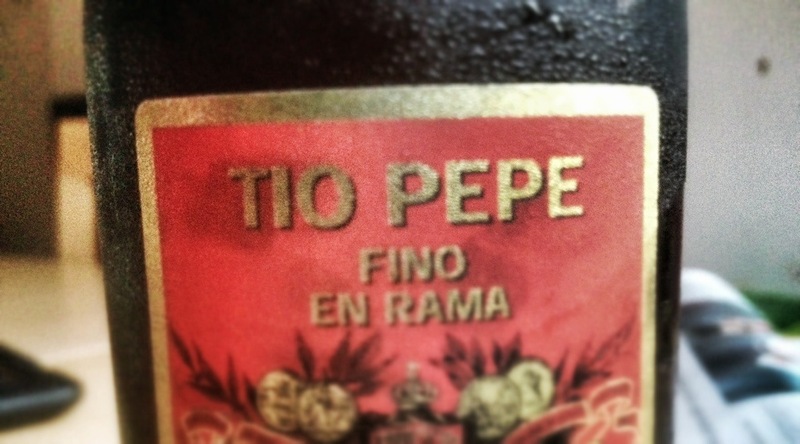 This entry was posted in Uncategorized and tagged en rama, fino, oloroso, sherry, tio pepe. Bookmark the permalink.